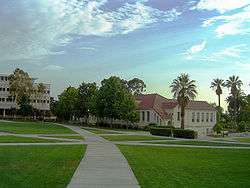 Whittier College is a private liberal arts college in Whittier, California, United States. As of fall 2015, the college has approximately 1,725 enrolled (undergraduate and graduate) students. 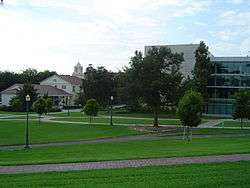 Whittier College is a private liberal arts college. About one-third of Whittier's student body is Latino, and approximately twenty-five percent of the professors are minorities or are from foreign countries. A majority of the student body hails from California, Hawaii, and the Pacific Northwest, but the college also draws students from the East Coast and the Midwest and overseas students. As of 2012, there are students from 28 states and 14 countries. Whittier offers over 30 majors and 30 minors offered in 23 disciplines, and claims emphasis on interdisciplinary learning. Students may also apply for entry into the Whittier Scholars Program, in which each student, under the guidance of a faculty member, designs their own major and course of study based on individual interests and career goals. Professional internships and service projects are required or recommended as part of many academic programs. Study abroad is offered in semester- or year-long affiliated programs. There is also an optional January Interim session, available for an additional fee, which is a four-week intensive "mini-semester" that typically involves fieldwork and faculty-led international travel. Whittier College hosts a Faculty Masters Program, which it says is modeled after similar programs at Oxford and Cambridge universities. In this program, three faculty are selected as faculty-in-residence for a multi-year term, live in houses located on-campus, and create and host in their homes educational and social programs around a specific theme, such as health and society, writers and writing, alumni connections, and Spanish culture. Events such as professionals—from artists to authors, musicians and entrepreneurs, politicians and scientists—and enable students to interact with, listen to, and often times dine with an invited speaker. Recent guest participants in this program include world-class authors Maxine Hong Kingston and Ray Bradbury, and filmmaker Morgan Spurlock. Whittier College has approximately 90 registered, student-run organizations. The College also has Societies similar to fraternities and sororities. There are eleven societies: the Franklin Society (Male), the Lancer Society (Male), the Orthogonian Society (Male), the William Penn Society (Male), Palmer Society (Female), the Ionian Society (Female), the Metaphonian Society (Female), the Thalian Society (Female), the Athenian Society (Female), the Sachsen Society (Coed), and the Paragonian Society (Genderneutral). Each of these societies began as literary societies. Other campus groups include student publications, the Quaker Campus newspaper and television; the Acropolis yearbook; and the student run radio station, KPOET Radio, Video Productions Studios, and the Poets Sports Network. Alumni include: Former U.S. president Richard Nixon , Actress Andrea Barber, known from the television comedy Full House and author Jessamyn West, Susan Herrman, who, while an exchange student at Fisk University, was one of two white female "student Freedom riders" who sought to desegregate interstate bus travel in the South in 1961. The liberal arts university was founded in 1887 by members of the Religious Society of Friends, thanks to the generosity and efforts of local business leaders Washington Hadley and Aubrey Wardman. It was named after Friends (Quaker) poet John Greenleaf Whittier. Student athletes at Whittier College are still known as the Poets in his honor. 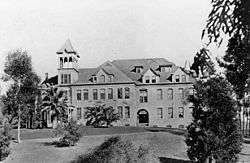 Whittier College grew from the academy and was chartered by the State of California in 1901 with a student body of 25. In the 1940s, World War II and the call to enlist caused the college-bound and college-enrolled male population to sharply decline; so much so that Whittier College agreed to absorb the entire student body of neighboring Chapman University. Service projects and service clubs, focusing on aiding and comforting soldiers oversees and training in domestic camps, sprung up on the Whittier campus; these efforts included a toy, clothing, and candy drive for children in Japanese American Internment camps. As the war ended and veterans returned home, Whittier College's enrollment lists once again swelled. This began a prosperous time for the College, and a construction boom soon followed. Most of the major buildings on campus have been built since the late 1940s—three in the 1940s and 1950s, seven in the 1960s, three in the 1970s and 1980s, and five since 1990. The latest addition to the campus, the Campus Center, was completed in 2008, while the Graham Athletic Center and Lillian Slade Acquatics Center completed a major renovation and expansion project at the start of 2012. An event reminiscent of the famous alumnus Richard Nixon occurred at Whittier in 2002 when an electronic bugging device was found in the office of the college newspaper, the Quaker Campus. The discovery quickly made headlines on the Drudge Report, the Student Press Law Center and other media outlets due to the similarity to the bugging of the Democratic National Headquarters in 1972 that brought down Nixon's presidency in the Watergate scandal. After over 125 years, Whittier College is a cosmopolitan vanguard of 21st century society, recognized worldwide as a distinctive and relevant liberal arts college, offering additional graduate degrees in both education and law. More than 40 percent of Whittier College undergraduates, and three of its four Rhodes Scholars, are from underrepresented ethnic and international groups; this kind of cultural diversity, which permeates both classroom and campus community, profoundly strengthens intellectual discourse and provides a realistic exposure to the kind of world students will enter upon graduation. Students and faculty continue a long tradition of community service, echoing the Quaker conviction that helping others is a moral obligation. International study opportunities enrich every field and major, reflecting the Quaker idea that truth transcends the boundaries of race, culture, and nation. Whittier Law School, located on a separate campus in Costa Mesa, extends these educational values and core principles, preparing students for legal careers through a curriculum and practice that emphasizes social service, conflict resolution, international jurisprudence, and professional ethics. The Whittier College Poets compete in the Southern California Intercollegiate Athletic Conference (SCIAC) of NCAA Division III. The school has fielded sports teams for over 100 years. Its current teams include football, men’s and women’s basketball, cross country, soccer, swimming and diving, tennis, track and field, lacrosse and water polo; women’s softball and volleyball; and men’s baseball and golf. The storied history of the Whittier College football program began in 1907, and since the inception of the Southern California Intercollegiate Athletic Conference in 1915, the Poets have captured 26 conference titles. From 1957–1964, Whittier won eight straight SCIAC titles under the direction of legendary coaches, George Allen (1951–56, 32-22-5), Don Coryell (1957–59), and John Godfrey (1960–1979). Their most recent championships came back-to-back in 1997 and 1998. 23 Poets have earned All-American honors, the most recent coming in 2007. The football program plays out of Newman Memorial Field, which seats 7,000. Whittier maintains a century-long football rivalry with the Tigers of Occidental College; the two schools play for the shoes of 1939 All-American Myron Claxton. The Whittier Lacrosse Program was established in 1980. In 1980, the Poets became a member of the Western Collegiate Lacrosse League (WCLL). From 1980 to 1999, Whittier won ten championships. As a result of their success, Whittier decided to become the first and only NCAA lacrosse program on the west coast. In 1990, they were recognized by the NCAA, but continued to compete in the WCLL. The Poets were the team to beat throughout the 1990s and it was not until 2000 when Whittier made the decision to make their mark on the national scene by leaving the WCLL and focus on being selected for the NCAA tournament. The lacrosse team has not been playing strong since the mid-2000s, though they have been a national contender every year since 2000 in the NCAA, as a quarter-finalist in 2003, and a semi-finalist in 2004.
the Whittier College men's water polo team has gone number 1 in the Collegiate Water Polo Association Polls (CWPA) in Division III no less than four times. Starting in 2004, another time in 2009, and two years in a row starting in 2013 and 2014. On the season the Poets finished 23-10 and ranked No. 1 in the country among Division III programs. WC shared the top honor with Redlands and was ranked No. 18 in the Men’s National Collegiate Top 20 Poll – a poll that ranks all divisions of collegiate water polo. The Whittier Cross Country team (known as #DubCXC) made its mark in 2016. For the first time in program history, the Whittier College Men's Cross-Country team has earned a national ranking announced by the United States Track and Field and Cross Country Coaches Association. The Purple & Gold come in ranked No. 32 out of 400 teams. They have put together impressive races this year finishing 2nd at the SCIAC Multi-Duals (7-1) before posting a 3rd place finish at the Pomona-Invitational. The Whittier College Men's & Women's Swimming & Diving teams earned Academic All-American status Tuesday morning the women for the fourth straight year and the men for the first time after the College Swimming Coaches Association of America (CSCAA) announced the programs who achieved this honor for the 2015 Fall Semester. Five hundred and forty-seven swimming and diving teams representing 354 colleges and universities have been named College Swimming Coaches Association of America (CSCAA) Scholar All-America Teams. The awards are in recognition of teams' that achieved a grade point average of 3.0 or higher during the 2015 Fall Semester. That is up 40 teams from the previous Fall Semester. The women's team finished with a 3.35 overall G.P.A. and the men had a 3.00 G.P.A. Whittier Law School, located on a satellite campus in Costa Mesa, California, started in the Hancock Park section of Los Angeles in 1966 as Beverly Law School. In 1975, Beverly College joined Whittier with the law school moving to Costa Mesa in 1997. Whittier Law School has 4,500 alumni, practicing in 48 states and 14 countries. The school has been accredited by the American Bar Association (ABA) since 1978 and has been a member of the Association of American Law Schools (AALS) since 1987. Charles Bock, author, best known for his novel Beautiful Children which was selected by The New York Times as one of their "100 Notable Books of 2008." Peter Baron, team manager of Starworks Motorsport. George Allen, head football coach for the Poets from 1951–56. Former NFL head coach and a member of the Pro Football Hall of Fame. Jerry Burns, former head coach Minnesota Vikings of the NFL. Assistant coach for Poets football team in 1952. Duval Love, offensive line coach for the Poets in 2008. Former NFL offensive lineman. Ty Knott, former assistant coach for the Poets. Former NFL assistant coach with the Jacksonville Jaguars, New Orleans Saints, and Green Bay Packers. 1 2 3 4 5 "Whittier College Facts & Figures". Whittier College. Retrieved February 21, 2016. ↑ "Best Colleges 2017: National Liberal Arts Colleges Rankings". U.S. News & World Report. September 12, 2016. ↑ "2016 Rankings - National Universities - Liberal Arts". Washington Monthly. Retrieved September 6, 2016. ↑ "100 Notable Books of 2008". The New York Times. November 26, 2008. ↑ "Betty Miller Unterberger: Curriculum Vitae" (PDF). Texas A&M University. Retrieved October 23, 2010.